Click the image to view a larger PDF version. 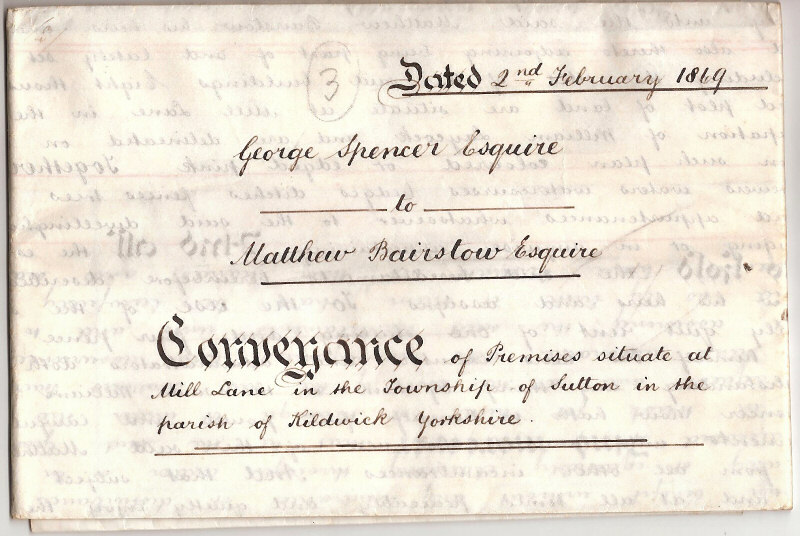 Above is a deed for the sale of New Laithe Farm (it doesn't say so on the document), but shows East Field, now East Field Place. The foot path on the bottom of the plan I think is now Bridge Road. This lot cost Mr Matthew Bairstow five hundred and twenty five pounds on the second of February 1869. All the documents are on parchment either goat skin or calf skin. 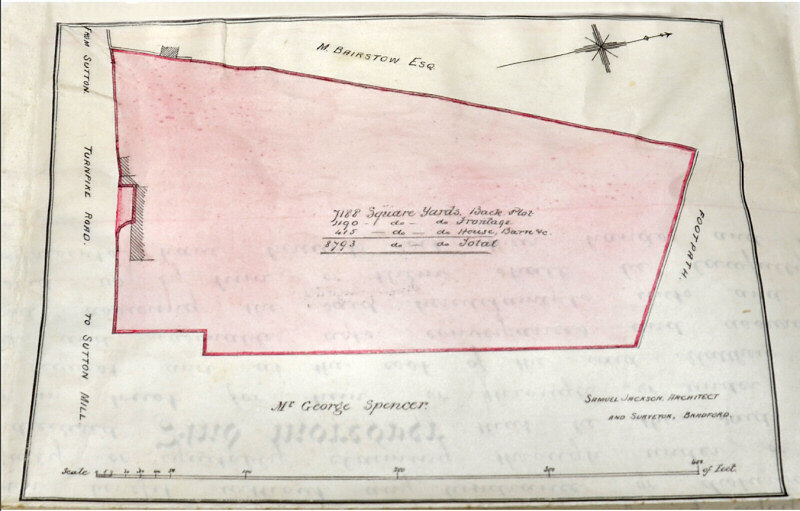 The land in the deed was bought from George Spencer, a son of William Spencer of Malsis Hall and the brother of Mary Sarah Spencer, who married James Lund. 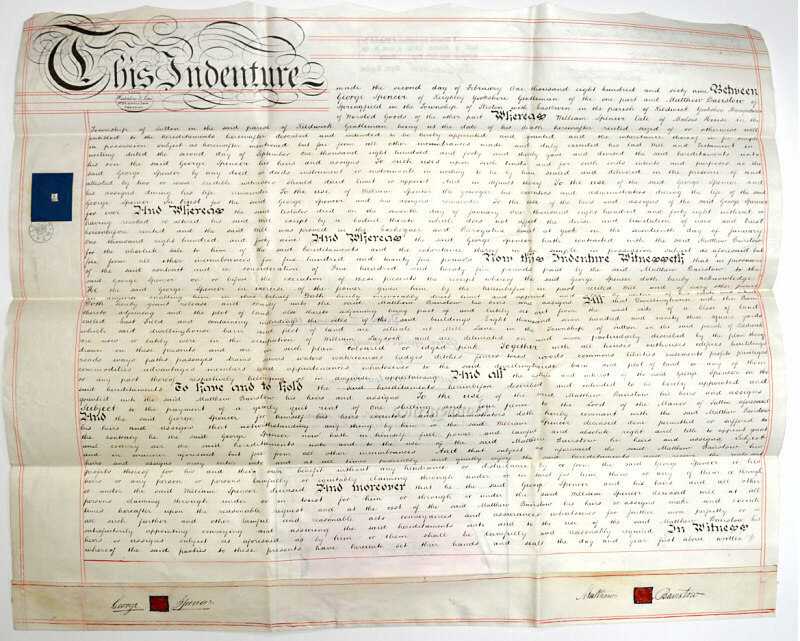 The Spencers appear to have come from Silsden and began buying land in Sutton during the last quarter of the 18th century. They bought Malsis Hall and 200 acres of land from Horsfall about 1783. They also owned the corn mill about this time. The deed refers to the purchase of New Laithe Farm, now Mulloys Garage. The reason the road is referred to as a turnpike may well be due to its connection to Sutton Lane which was put through to Eastburn at the very end of the 18th century. It was built to connect the village directly into a new section of the Keighley to Kendal Turnpike Road that ran from Eastburn to Kildwick Bridge, avoiding Crosshills. However, as the lane led directly into the new turnpike road it could not be used without paying a toll once you stepped onto the turnpike itself. As a consequence the new lane is recorded as having been little used, presumably because of the charges. The preferred route to Eastburn appears to have remained the old road, which went down passed the old corn mill (alongside the present Cricket Club), across Holme Beck and along Old Lane, crossing the turnpike into Lyon Lane and on to Eastburn. The section of road shown on the plan was more properly known as Mill Lane (now Main Street) and had itself been built to replace a previous route to Sutton corn mill, which ran from Fall Bridge, along Wet Ings Lane and directly to the corn mill, crossing what is now Park Avenue, Park Lane and Victoria Street. Low Bridge, at the Bull, and Mill Lane were probably built in the early 1700s to provide better access to the corn mill for farm carts and waggons. The footpath shown to the north on the plan is presumably now Bridge Street. This path continued along to Holme Bridge, crossed the road and ran along the edge of the beck through Jenkins Hole and Norders, now referred to as Thompson's Field, to Hazel Grove. The section through Thompson's Fields was closed in 1818.